If you’re in agreement with the majority of students on campus, you are about done with this weather. Here are some tips on how to avoid the Winter Blues! Music! My ride or die these days is an upbeat, happy playlist of music. The last thing I do before leaving for class is pop in my ear buds and start a happy playlist. It seems simple but can truly brighten your mood on your way to class. Exercise! This one is important too. Get up and exercise. Whether it’s a ten minute run on the treadmill, or a short abdominal workout, it will be affective. Exercising release endorphins that will make you happier. Relax! it’s okay to slow down and relax every once in a while. Take time to treat your body right and get it refreshed and ready to go for the next day and the days ahead. My favorite way to do this is snuggle up in my bed and play music to focus my mind. Beyond these tips, there’s the obvious, drink orange juice, take vitamins, and call a loved one every once in a while to check in on how things are going at home. I hope this helps those of you struggling with the winter blues!! Posted on February 1, 2019 Categories GeneralLeave a comment on Winter Blues!! Hello Hawkeyes! From the moment I moved into college, there was at least one person a day looking forward to the Holiday season and winter break. I didn’t understand, college was awesome, challenging, a giant field of learning experiences, and so much more. Why my peers were looking forward to winter break, I didn’t understand. Until, I spent a month at home and truly learned how my life had changed since moving to Iowa City. There were so many refreshing things about being home. Family is the obvious one. I missed my siblings SO much. After my oldest sister moved out from home, I became the oldest (and most protective big sister over my brother and sister). I watched them grow for five years and took every opportunity I had to teach them something new. Being home with my siblings and parents was amazing. We talked, joked, and ate family dinners just like before. I saw my closest friends from home and we picked up just where we had left off. We ate dinners, talked into the dead of night, and reminisced on our times together in high school. 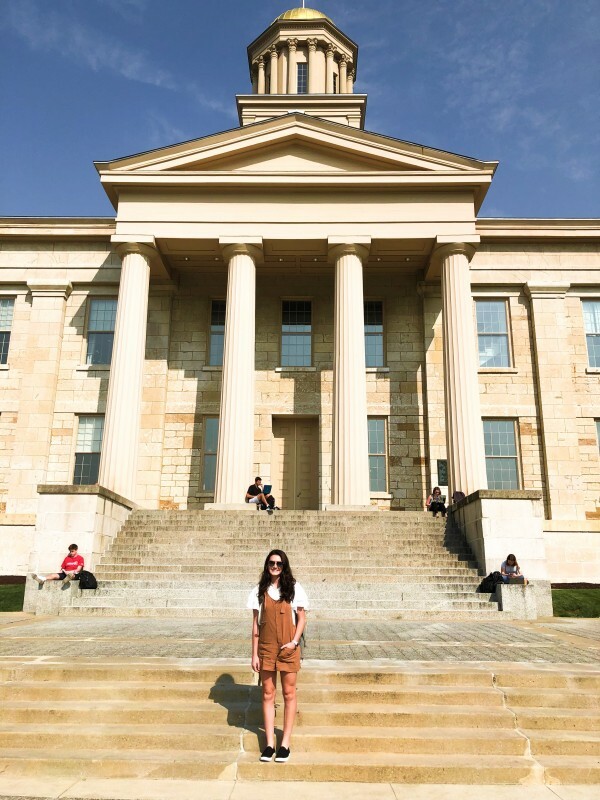 While I was thankful for this time at home, I realized how much the University of Iowa had changed my life and all the things I missed about it. Beyond these things I longed for over break, I missed being close to people. When I say close, I mean close. I went from living steps away from my best friends to having to work really hard to create plans with friends from home again. Which don’t get me wrong, I didn’t mind organizing plans with my friends from home but, I missed the simplicity of walking a couple of doors down and having multiple people to talk to and talk about my day with. Living on campus this first year has brought me so much joy. There are so many things close within reach and yet, take time to notice. I guess what I am trying to say is, adjusting to college is interesting. There were so many new things to get used to but, once I was used to them being home wasn’t all it’s cracked up to be. You learn so much your first semester of college and all of it is for the better. You’ll want to go home, yes. It will be great, yes. But, if you’re truly where you’re meant to be, you’ll miss campus and all of its beauty, you’ll miss your hall mates, and you’ll miss the local food chains you can only get downtown. Iowa City has become my home and I couldn’t be happier. How To Tackle Finals Week! Well Hello, after a long hiatus from writing, I am back to give some advice on how to tackle finals week and avoid exactly what I could not. You will repeatedly hear from teachers, upperclassman, and faculty to start studying the materials many weeks in advance. You probably won’t, just as I did myself but, here are some reasons why you most definitely should. A lot of students go to school here but you will see every living soul on finals week, and I mean every single one. The Main Library, Memorial Union, Tippie, and pretty much every other study spot on campus will be buzzing. The food will be gone, the spots will be filled all the way to the third floor and above, and you will be very overwhelmed. You can try until you’re blue in the face but you will not remember everything you crammed into your head the night before. You just won’t. I thought I had learned better in high school but clearly, the naive first-year student in me needed another wake-up call. My point is not to scare you but to help prepare you. I was moderately successful in all of my finals and finished with grades I was proud of. However, there is no worse feeling than knowing you could have done better and you should have spent more time with your nose in a book. Finals week is a very stressful time for everyone who is involved. For the seniors, here begin their lasts. Some of them will graduate next week, a semester early or right on time. For the freshman here starts their journey. This is the first final test on if they will make it all four years or not. A lot of students will decide/have already decided whether they’re continuing their journey here or not. For everyone in between, their coursework is major/career specific and very important. They are applying to nursing school, business school, and a lot of other things that will be more important to me next year. With that being said, there are many things the faculty does here on campus to relieve some of that stress. Massages, free food, and puppies are just a few. The Iowa Memorial Union and your student email will keep you updated on all of these cool events (which, I think I should add, you will not be able to enjoy if you are cramming all of your studying into one night). The University wants you to succeed not only for your own good but for the University as well. We as students are representing so much more than just ourselves here on campus. We are representing a family name, a place we called home for eighteen years and, our career field of choice. Also, a little random piece of advice to throw in here. If you are a first-year student start collecting your flex meals early. You will be craving some chips or, you may have even skipped dinner do to long study hours. On the day you decide to go get a flex meal from the marketplace during finals week, there will be empty shelves and a cookie left if you’re lucky. The early bird got the worm in this situation and I was left with no snacks and sometimes even no dinner because of the vultures who turned the marketplace upside down. Learn from my mistakes, happy finals week! Posted on December 12, 2018 Categories GeneralLeave a comment on How To Tackle Finals Week! The 2018 University of Iowa Homecoming was one I will never forget. From participating in events with my sorority, getting 2nd place in a bags tournament, and beating Maryland while waving to the kids, this years homecoming allowed me to create so many fun memories and forced opportunities out of my comfort zone that helped me grow immensely as a University of Iowa student. Homecoming week kicked off with with a series of student organization and fraternity and sorority life events. The first of those being, the sustainability project and can-struction. This was where students worked together to create sustainable projects using nonperishable food and recycled items for healthy competition. On Wednesday, perhaps my favorite day was the Black & Gold Bags Tournament. This was something I participated in as a student and had so much fun doing. My partner and I were so surprised to have made it to the championship. We had so much fun, the outcome didn’t matter. 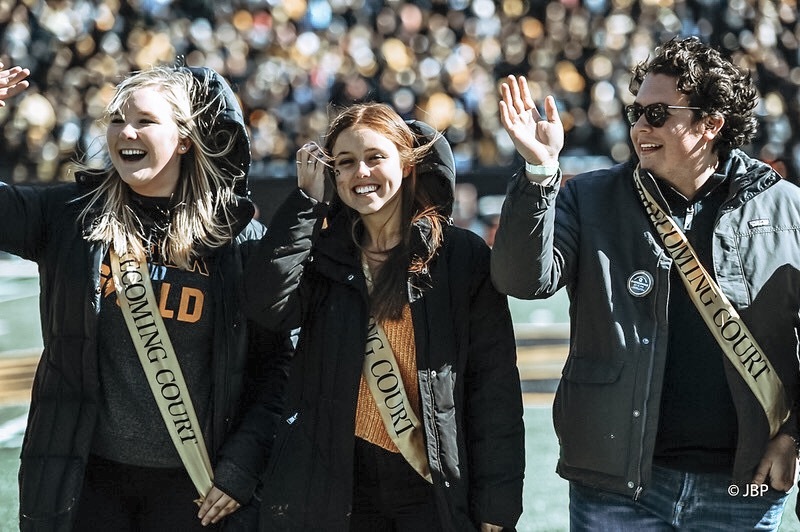 Thursday, students returned to the Pentacrest for the Iowa Shout competition and homecoming court Coronation. 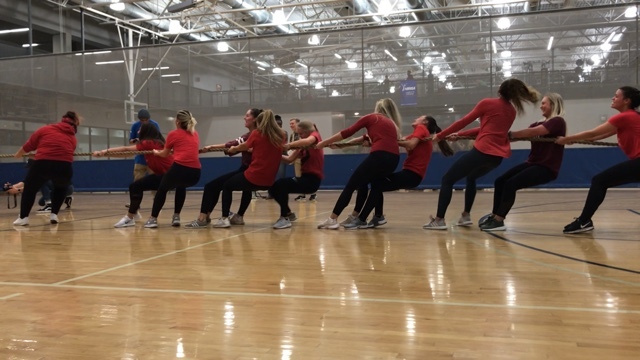 This was such a fun night watching all of the student organizations and fraternity and sorority members compete the skits they worked so hard on. Friday is always a historic night for the university. I had the pleasure of volunteering at the parade this year. The homecoming parade is so special and such a great opportunity to honor many distinguished alumni and current students. 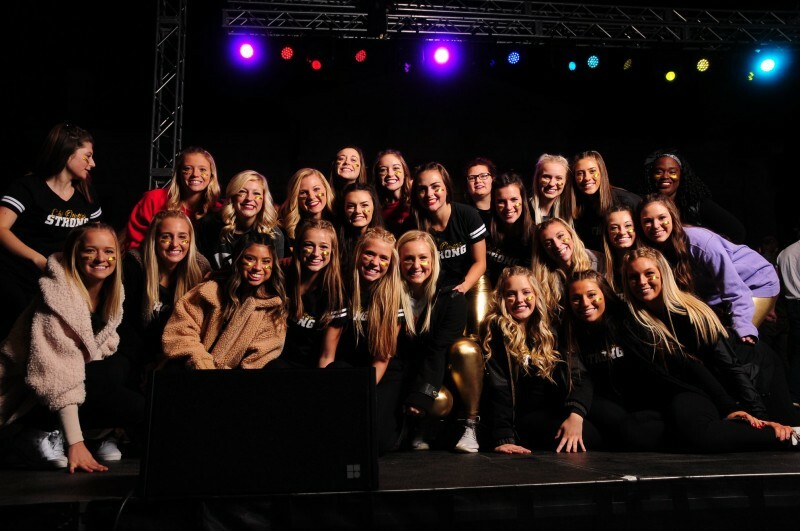 Some of these including, Iowa’s Golden Girl, Miss Iowa 2018- Mikayla Hughes Shaw, athletics such as the Men’s Gymnastics Team, local high school marching bands, many student organizations, and so much more. All of these events lead up to the most exciting part of homecoming, the football game. This year the Hawkeyes played Maryland and pulled out a win. During the first quarter, we waved to the kids. During halftime, we honored the court and, in the end, we celebrated with song, cheer, and a huge GO HAWKS. My first Hawkeye Homecoming was such a great experience. It was so cool to see so many students and faculty involved and excited about what the university had to offer. Seeing the alumni feel at home here no matter how many years have passed was so humbling. The University of Iowa atmosphere is like no other and I feel so blessed to be a student here! Posted on October 25, 2018 Categories GeneralLeave a comment on MY FIRST HAWKEYE HOMECOMING!! Here I sit, Tuesday morning, already half way through my second day of school. I have rallied up 10 things I learned on my first day of school in hopes of helping those entering the wild, ambitious, challenging years of college. You could be thinking, “How much could you have possibly learned on your first day of college?” Well, here is your answer. Bring an umbrella. You heard it here first. I, along with many other students (who were not all first year students, might I add) forgot an umbrella and/or did not check the forecast prior to walking outside. My first day started adventurous as I walked to class under the rain, sharing half an umbrella with a friend. Beautifully curled hair? Gone. Warm crewneck laced in perfume? Now smelled like rain and sweat. Geraldine’s precisely, outlined eyebrow? Also gone  Moral to the story, bring an umbrella and always check the forecast before you leave your new home. It’s okay to be nervous. Walking up the steps of the Pentacrest to my first college lecture of roughly 400 students, I felt butterflies swarming inside my stomach. I knew it was Syllabi Week but did I really know what to expect? No. How can you? Your nerves will settle as the class seems to appear not that bad after all, and you will feel a smile start to form with positivity. You know there will be challenges ahead, but this first lecture will leave you feeling hopeful and motivated. Your stomach will be taken over with nerves once more, as you head to your second class of the day. The next day, will feel the same. The giddy, eager, heart of a first year student is so beautiful. Staying motivated for me will be hard eventually, but this University offers all the tools you thought possible to help you succeed. Take advantage of those resources, and take advantage of them quickly. After the conclusion of my first lecture, before my second class, some friends of mine and myself trucked it to the library to explore study spaces and everything the University Library has to offer. First off, there’s a Starbucks. All of you coffee lovers out there might take to love this area of study for that simple fact but, what drew me in, was the high tech, colorful, study cubes. Here you can reserve a study room equipped with dry erase boards, swivel chairs, outlets, and projectors. You can quite literally do anything, for any class, in this space. So, adventure out on your first day and explore cool, quiet places to help you get a head start on the two chapters of General Chemistry homework you already have. The University of Iowa uses an app called Pocket Points. On this app you can set a timer to stay off your phone, away from distraction, for any amount of time. The longer you’re off your phone, the more points you will earn. With the points earned, you will be offered deals around campus for food, clothing, and much more. It’s okay to sit with your friends in class on the first day. It will not prohibit you from learning, unless you allow it to. You want to remember your first day of college so, sit by your friends. They may not be your friends forever but they can be a great companion for the first day of classes. DO NOT take the bus. Even if it is pouring down rain, enjoy the walk and the memories you’ll make on that (shorter than you think) walk to class. From a friends experience, waiting for the bus on your first day could result in being ten minutes late to your first college lecture ever. The app is almost never correct. Bring your student I.D everywhere. EVERYWHERE. Something that is helpful but could be dangerous if not communicated properly with your guardians is, the charging of the UBill. “Would you like to pay cash, credit, or out it on your student UBill?” You will be asked this everywhere and let’s be honest, for most of us UBill means mom and dad’s bank account and not your own. I cannot even count how many times I heard “I could just charge it on my UBill” just within my friend group the first day. Frantically visiting the Hawk Shop for missing items we didn’t have was a repeated action throughout the day. If you are not an organized person prior to college you will become one very quickly. You will learn to appreciate the calendar feature on both your cell phone and computer of choice. Within my first day of classes, I had due dates, meetings, outings, things to remember, etc. that I needed to add in my calendar, just to keep my head straight. If you enjoy handwriting your schedule, that is awesome! However, your schedule is highly likely to change after, or halfway through, your first day. Be prepared to erase and/or re-write your schedule many times. Accept every call from your guardians. They care about you and are eager to hear how you are adjusting. Sure, it can be annoying when you receive a call every hour, and maybe you can intentionally ignore a few throughout the day. Odds are your family will miss you before you can even stop to think about missing them. Sound excited on the phone, but be truthful and transparent. Your guardians and those who invest and believe in you want to help you with this new transition. With that being said, here is the most valuable lesson I learned on my first day as a freshman in college. Everyday that passes is one you cannot get back. Many people in your family, including contributers around the country have bonded together to get you to college and are excited to watch you thrive and succeed. Making friends might take time, but what doesn’t take time is, a smile to the reception clerk working two jobs while attending school, complimenting the person next to you on the morning bus, and spending time in a grateful mindset throughout the day. Enjoy your new chapter, this day is one I will never forget. There are SO many things to prepare before moving to college! Orientation, dorm room, books, finacials, and the list goes on! I could sit here and tell you how to get the perfect dorm room on a budget (infact I did, in a recent post.) I could tell you how to buy your books on Amazon and how not to purchase them until the first week of classes are over. I could even tell you my story with finding a roomate and how to “trust the process” and know it won’t be so bad afterall but, this isn’t why I am here today. Yes, those things were fun to prepare for, I learned so much within the process of preparing for college but, it turned out they weren’t really that important. Why I am here today, is to tell you about the things you CANNOT prepare for. I know, I know, harsh. But, you all need to know, within the months, even weeks of moving into college, your life might fall apart (not actually, we are all so blessed) but it will feel like it’s falling apart I am sure. Within two to three months before moving to college I had so many things thrown at me, I honestly don’t know how I stayed standing. I pulled acceptance from the Univeristy of Alabama and comitted to the University of Iowa (hard. ), I broke up with my boyfriend of 6 years (harder), my family and friends traveled the world leaving me home alone for two weeks, which left me feeling lonlier than I ever had (just. plain. sad). I experienced a spritual awakeing that changed my life (good but, CRAZY), I graduated highschool, I left every activity I had ever known for a summer full-time position as a nanny, and most of all, I stressed about the biggest event to come, College. All at the same time, my mind was constantly pulled a thousand directions. As my mom would say, I was quite literally “living on a prayer”. I hope I didn’t scare you away but this was my terrifying truth. It all happened so fast. Out of nowhere, I was blinded by so many obstacles. At the time, I prayed that life would just be “normal” and perfect but silly me, without these experiences my life would be SO incredibly different. I wouldn’t be at Iowa. Plain and simple. In fact, after my first semester across the country (had I attended Alabama), I would be thousands of dollars in debt, I would not know Jesus the way I do now, I would not be able to handle a long distance relationship that wasn’t pursuing the desires of my heart, and I wouldn’t have spent as much time fixing myself rather than fixing those arround me. What felt like some of the worst and most confusing events in my life, turned into the greatest, most life changing blessings. Even looking out the window of Java House makes my heart skip a beat. I am so oddly thankful for the heartbreak and lonliness I felt while preparing for college. It taught me a lot personally but, my messege to the readers of this blog is to persevere. Whether your college preperation is perfect (I bet it won’t be) or your life falls apart (like I felt mine did). You will persevere. The college transition is scary but so so so fun! Just know that you are where you are heading for a reason and you will serve a purpose on the Univeristy of Iowa campus whether you see it right away or not. Now, believe it or not I didn’t take this advice from my parents. It took a 15 minute Ted Talk to crack this piece of information through my thick skull. Linked below is a Ted Talk that came across my Facebook feed some odd years ago. This Ted Talk intrigued me only by the key speaker, whom just happened to be an alumni of my high school. Her name is Thea Dennis, and she doesn’t know this but, she changed my life. Now, if you skipped past the video, I highly encourage you to take the time to listen. Now, believe it or not this 15 minute ted talk changed my life. If there is one lesson I would like you all to learn, especially my peers, it is that asking can have some very powerful outcomes. I encourage you all to chase your dreams and ask for opportunity. You never know, it could land you an experience somewhere, with someone you never imagined. Asking for what you want is empowering, effective, and enables you not only to achieve your goals, but to create totally new ones. So go out and chase your dreams with conviction. Never be afraid to ask questions, and always stand up for what is right. This message I passed on to my high school classmates, I now pass on to my college peers and friends. Asking questions can land you that internship you’ve always wanted, a job on campus that you may actually enjoy, and most importantly, a relationship with your professor that can give you the guidance needed to succeed in that really tough Chemistry class. Posted on August 20, 2018 Categories Academics, Campus Life, GeneralTags ask, college, freshman, opportunity, questionLeave a comment on JUST ASK!! OFF TO COLLEGE: Finding the BEST deals on college essentials!!! Heading off to college can be SO stressful! I’m sure I’m not the only one, but my number one stress reliever is.. you guessed it! Shopping. As a soon to be college freshman, I spent most of my summer (okay, all of my summer) searching the web for the cutest, most colorful, trendy dorm accessories. Also, as a soon to be college freshman I am on a budget! My main focus when shopping for my dorm was finding the best deals I could possibly find. A lot of my time searching the web was looking at different sites with the same products to see who wanted less money from my poor bank account. Whether your’e spending your own money (like I was) or your parents were kind enough to help you out, it’s very important that we stay focused on what really matters. That being our very, very, expensive education which, after all is why we’re here! Throw pillows can really complete your whole bed. They are the first thing people notice on a bed. So, they need to be an absolute vision! but remember, we’re doing this on a budget. My favorite place to look for pillows is Target. The pillows in these photos ranged anywhere from $15-$25 dollars in price. Now to some, that may seem a little excessive but when you’ve done your research like I have, you’ll know that places like Urban Outfitters and Anthropologie sell similar pillows with the minimalistic, boho style for anywhere between $40-$65 dollars in price. Now THAT is crazy town!!! One of my proudest, pillow shopping tools I used, was a coupon code from one of my favorite YouTubers, Jaclyn Brooke. With her code I was able to purchase one of these pillows for just $15. SO, let’s talk blankets! Everyone has a favorite, and throw blankets are mine. With the throw blankets, this is where I tended to “splurge” and by splurge, I mean I still did not spend over $50 dollars for a blanket. In fact, I believe the most expensive blanket was $42 dollars and some odd change. If you counted correctly, YES, there are five blankets shown. This is only because of the great deals I found. The top two quilted, fringe, beige blankets have their own story… let’s just say I got very lucky and happened to get them both for free upon the companies mistake. BUT, beyond that, I made sure to take advantage of the large number of department stores closing within the next month i.e. Bergners, Yonkers, J.C Penny, etc. In total, for those five blankets shown, I spent about $60 dollars!!! Which, if bought at high end stores, with no deal shopping at all, could have added up to be HUNDREDS of dollars. Decor is next! This was a hard one for me, believe it or not. I had no idea where to start or how to shop cost friendly for the cute things I wanted. For Decor, I tried to keep most of the things in my room now. Meaning, I designed my dorm room around the aesthetic of my room at home. This saved SO much money. I repurposed a picture frame and made is something very meaningful. At my graduation party I had all of my guests and family members take a polaroid picture and sign the bottom. This way, I could align them inside of a frame I already had and make this super cool, very meaningful, piece of art! Aside from using things you already have, or repurposing things around your home, I do have a few store recommendations to shop at for Decor! HomeGoods, TJ Maxx, Marshall’s, and sometimes Target will have the perfect, affordable, little gadgets that will make the perfect finishing touch to your dorm room! Okay SO, if you are lucky enough to have a bathroom and/or sink in your dorm room ( I luckily fall into that category) we need to talk bath items, soap, late night Walmart runs, etc. Bath and Body Works, if you catch it in the right season can be very affordable AND, in my opinion they have the best products when it comes to hand soap, body wash, and those very convenient wick less candle scents you need for your dorm room. Bath and Body Works almost always has some type of deal going on! Especially in between seasons. On the day I paid a visit the deal was 5 for $23 on the hand soaps. Now, this germaphobe, hand washing enthusiest was SO HAPPY. It was an offer I could not pass up. Of course I had to throw in Some WallFlower Inserts in my favorite scents; Salted Carmel and Mahogany Teakwood. My next secret tip (if you are spending your own money on all things college) pay a visit to Walmart every two weeks and slowly begin to check off your toiletry items in bulk. For me this meant, one week I bought an excessive amount of toothpaste, a huge bottle of mouthwash, three sticks of my favorite deodorant, and four toothbrushes. The next couple of weeks it was a value pack of makeup wipes, two lint rollers, three of my favorite Hask Dry Shampoo and, a large storage bin to hold everything that was now sitting on my bedroom floor. This, maybe didn’t save as much money but, it saved money for me to eat out with my friends or see a movie in the new LDX theatre in between paychecks. Time to get back to online shopping for new deals because what else would I do? Posted on August 17, 2018 Categories GeneralTags college, dorm, essential, first year, hawkeye, iowa, move in, shopping, uiowaLeave a comment on OFF TO COLLEGE: Finding the BEST deals on college essentials!! !